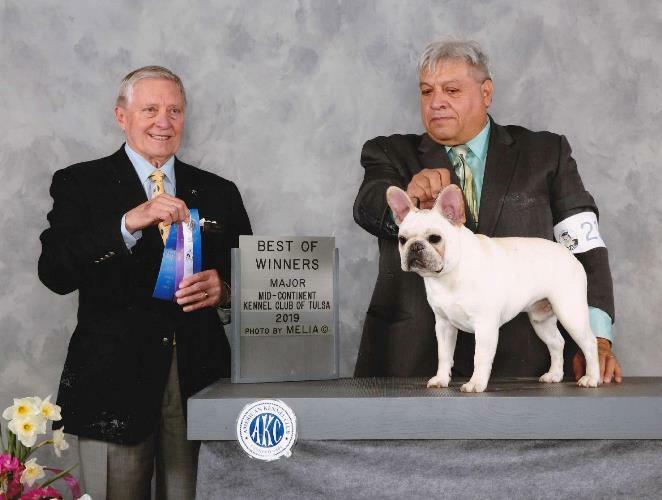 Cosmos is moving quickly through the 15 points including 2 major wins at AKC dogshows. He is a puppy in training with Prof. Handler Rudy Ayala of Ft. Worth. 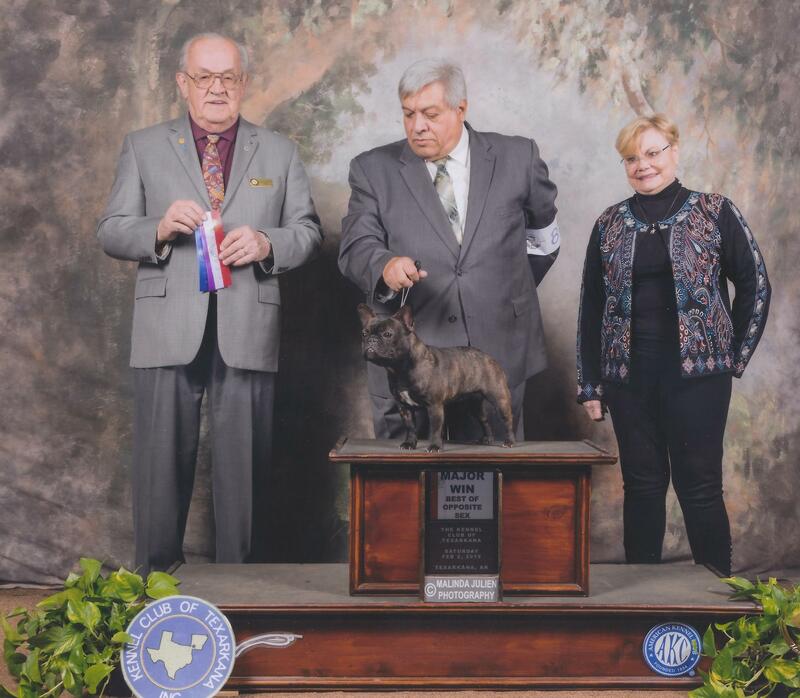 Cosmos was winners at Kerrville, TX; the next opportunity, he won his first major as Best of Winners. 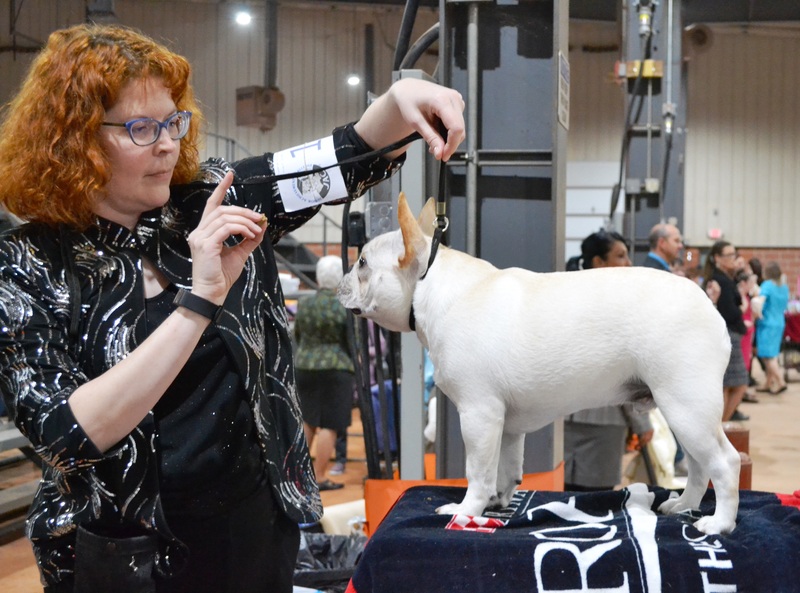 A few weeks later at Bossier City, he was again Best of Winners. 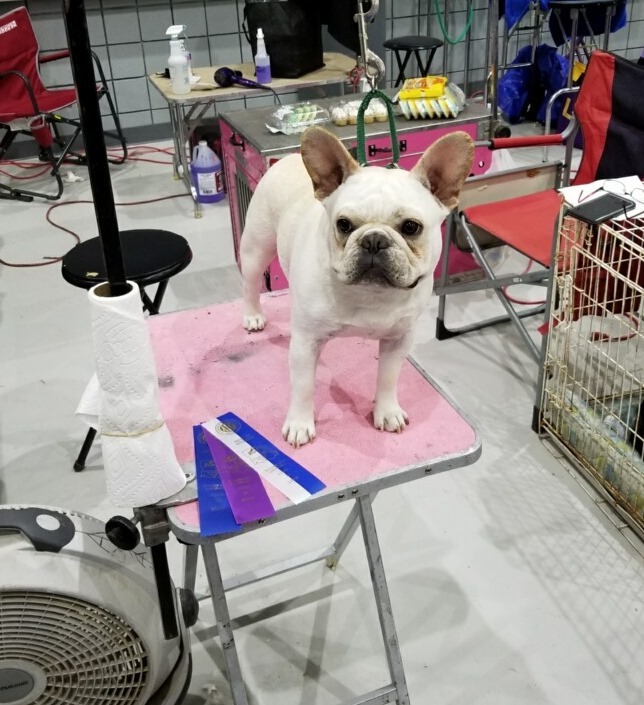 He's taking R&R with the Kirkpatricks, loving breeders/co-owners in Shawnee, OK. We are eager to see this Frenchie as a fully matured stud dog and our newest AKC Champ and expect him to complete his title in the Summer 2019. Looking at the debut of Cosmos in Nov. 2018, you can see the gradual emergence of maturity. 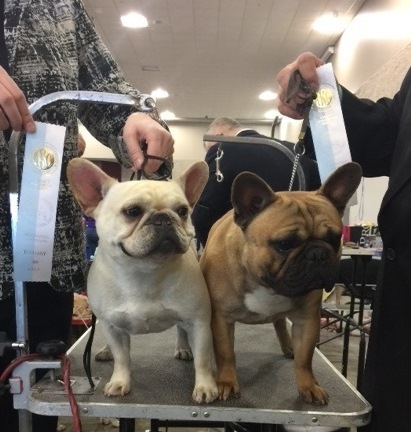 Over 35 Frenchie entries at Alexandria LA in February 2017, JerryLee and Chanel finished their AKC titles with 5 point major wins PLUS began their points toward Grand Championship titles. Presented by Rudy Ayala of Fort Worth. 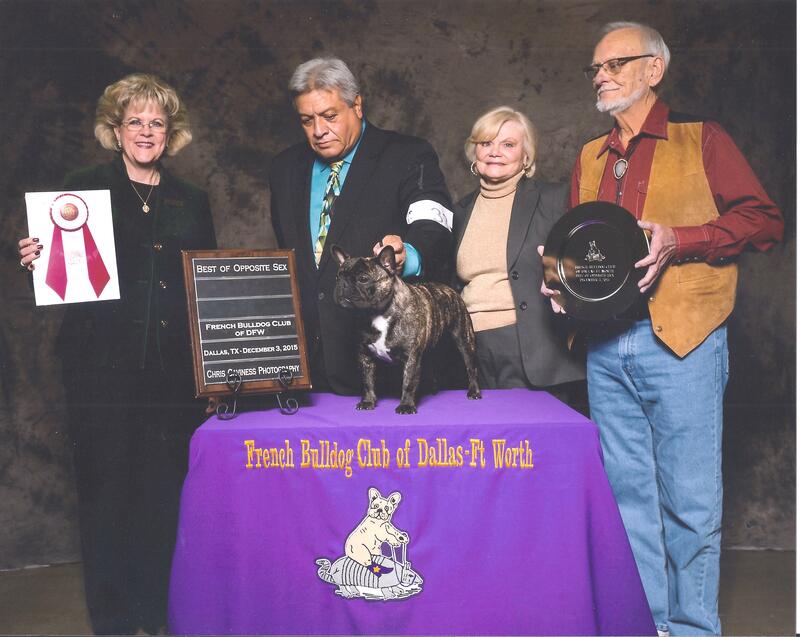 Now Grand Champions, thoroughly health-screened, they are building another healthy generation to the FANCIBUL story. JerryLee has his CHIC award for health. 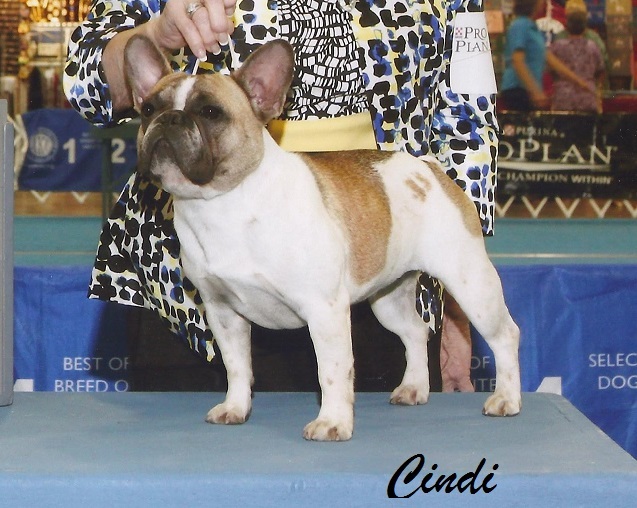 He is available at stud to healthy belles that meet the AKC standard. 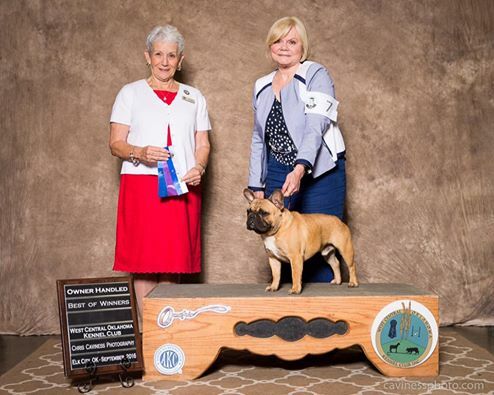 Born two weeks apart, JerryLee and Chanel have proceeded together through their show careers and completed the AKC titles the same day. 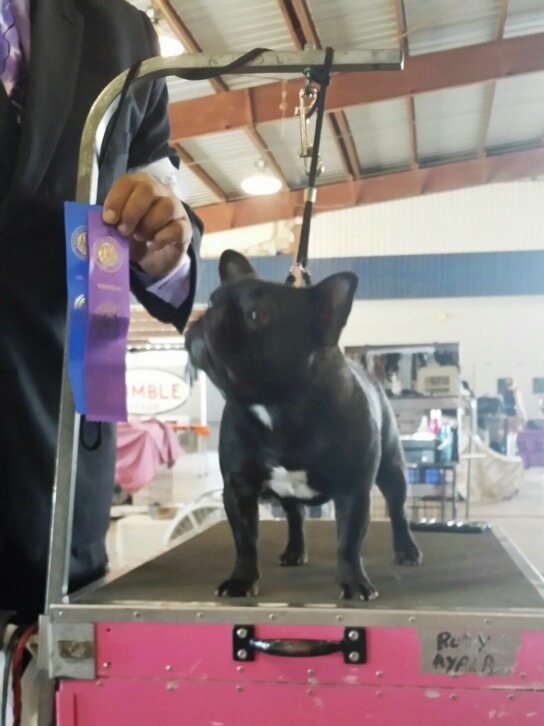 CHANEL IS EXPECTING PUPPIES SIRED BY JERRY LEE on April 19, 2019. 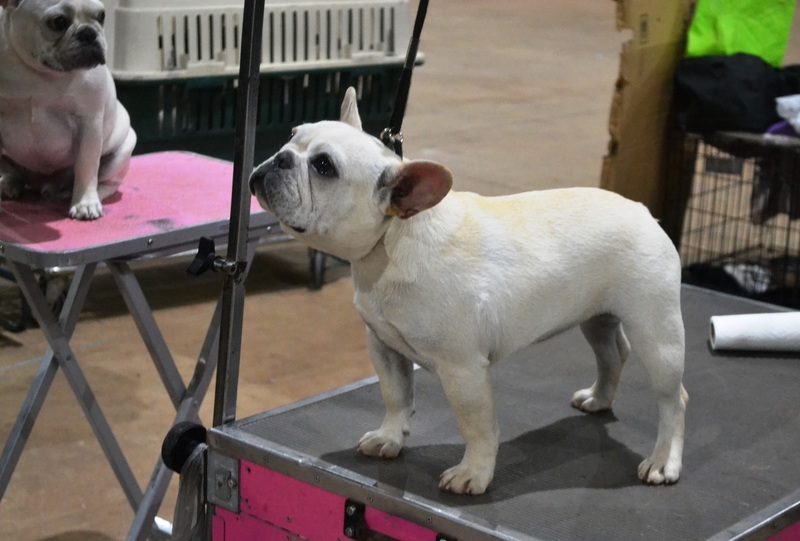 CHANEL had an exciting career capturing a 5 point major win on her debut in the showring. 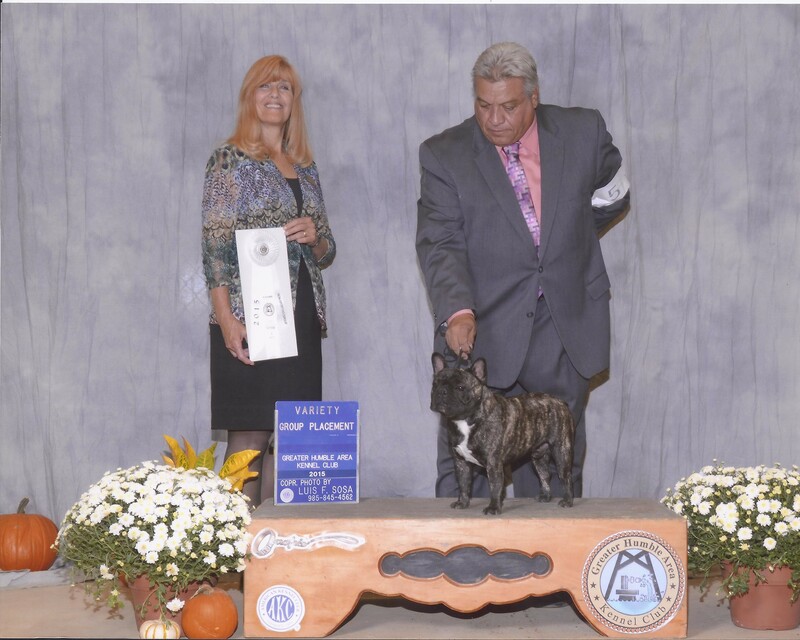 She won Best of Breed as a puppy over 3 championed males. 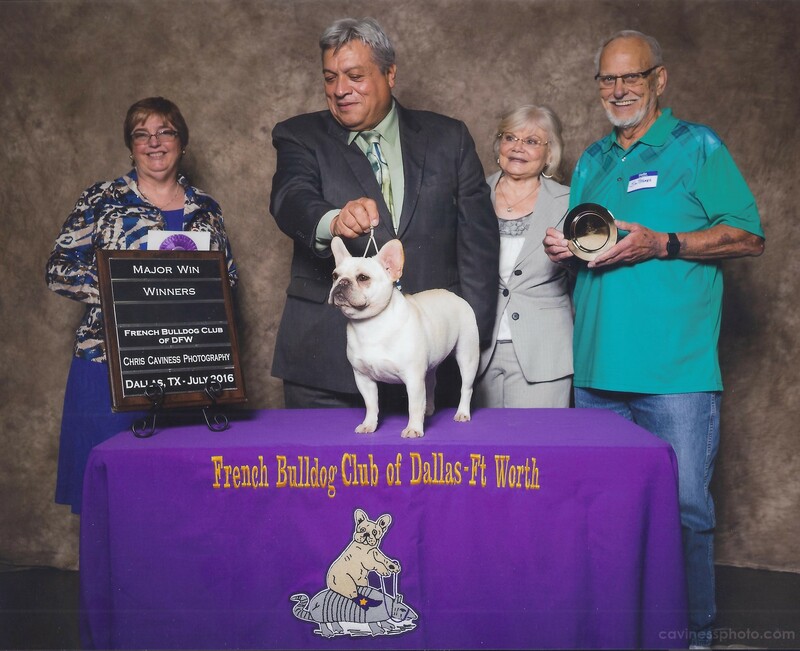 She was Winners at the D/FW French Bulldog Specialty, 2nd in Open Cream class at the National FBDCA Specialty, and then finished with another 5 point win and 12 points toward her Grand Championship title at the Alexandria LA cluster to start off 2017. 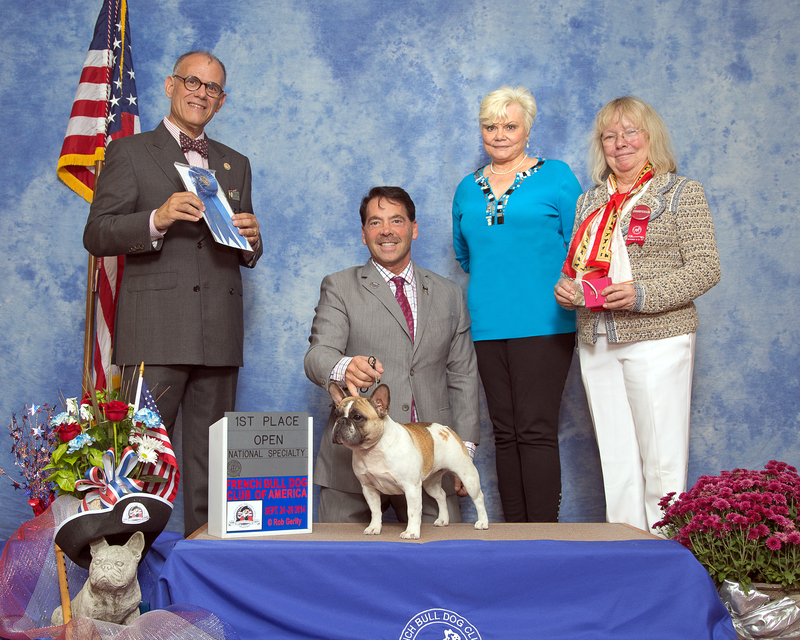 5 point major wins and was 1st in the piebald class at the FBDCA National Specialty in Boxborough, MA 2015. She is JerryLee's mom. Cindi is now retired and living her life with me. Sometimes I have a retiree for another forever home. Please write if interested in a well-trained, healthy older Fancibul. BARRY was born to be a show-off! He liked the stage beginning with his debut as a puppy. 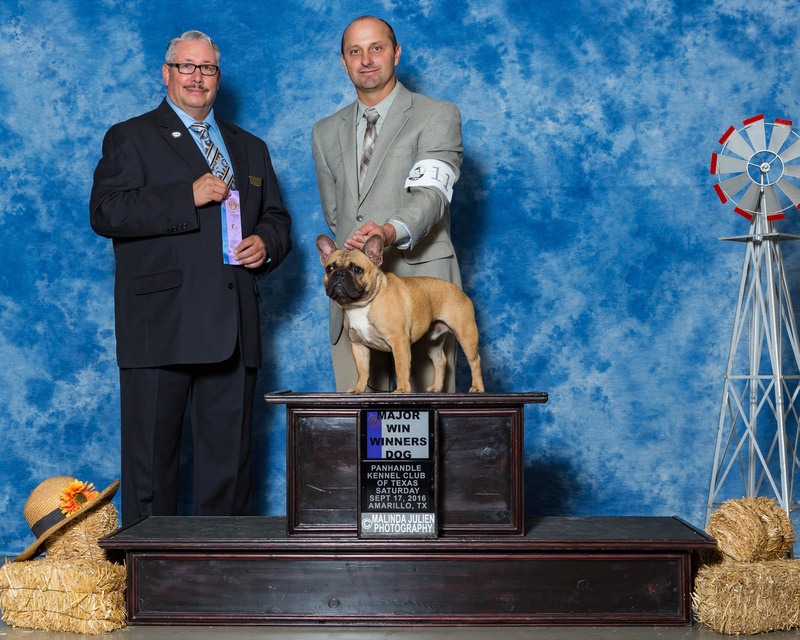 He finished his title in a few weekends and blazed through the grand championship in two with Prof. Handler, Rudy Ayala. 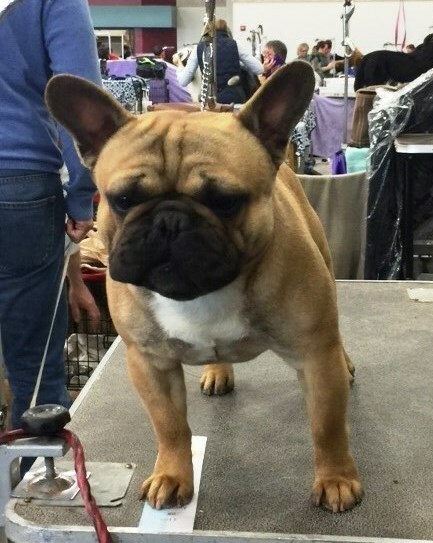 Most importantly, Barry achieved his CHIC in health screenings and has proven to produce quality as a stud dog -- just like his multi-champion producing sire, "Danny". 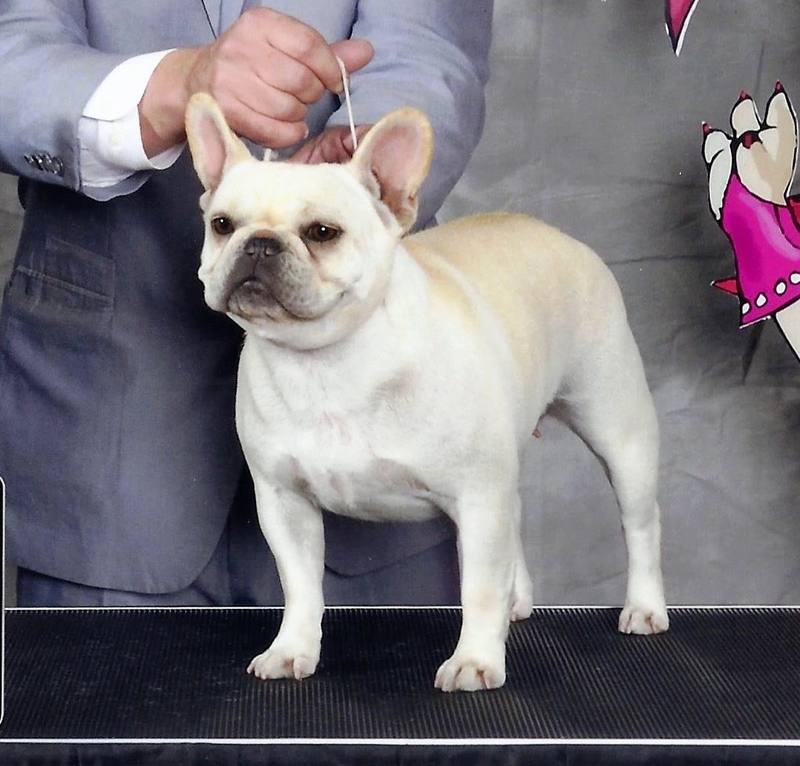 Barry is available at stud to females proven healthy and meeting the AKC standard .